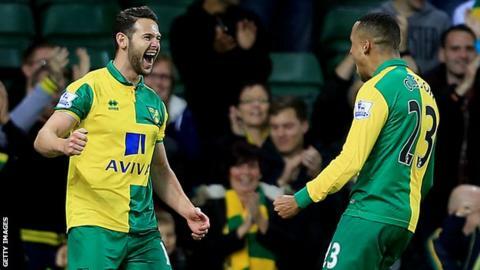 Norwich advanced to the fourth round of the League Cup with victory over Premier League rivals West Brom. Alex Neil's side broke the deadlock in the second half when debutant Dieumerci Mbokani slid in Matt Jarvis, who rattled in a rasping drive off the bar. Northern Irishman Kyle Lafferty, making a rare club appearance, doubled the lead with a fine low finish. An own goal from defender Sebastien Pocognoli completed a miserable evening for West Brom. West Brom were denied a consolation when Declan Rudd made a strong fingertip save from Rickie Lambert's shot from distance as Norwich held on for their first League Cup clean sheet since September 2012. Canaries captain Gary O'Neil had hit the woodwork with a deflected long-range drive in the first half. Defeat extends West Brom's poor run in the League Cup - they have only passed the third round in two of the last 10 seasons. Norwich manager Alex Neil: "Matt Jarvis was excellent, as was the rest of the team. "Kyle Lafferty did great. He got his goal and for the third if he wasn't in that position the ball wouldn't have gone in the net. "There were a lot of pleasing performances all over the pitch. Everything worked really well for us." West Brom manager Tony Pulis: "Three-nil was a bit harsh, especially in the second half. "At 1-0 we had some very good opportunities. James McClean, he could have stepped round the goalkeeper and touched it in. "Then they get the same situation down their end, Lafferty scores and it's the end of the game. I don't think it was a reflective score." Match ends, Norwich City 3, West Bromwich Albion 0. Second Half ends, Norwich City 3, West Bromwich Albion 0. Attempt missed. Callum McManaman (West Bromwich Albion) left footed shot from the left side of the box is close, but misses the top left corner. Attempt saved. Matthew Jarvis (Norwich City) left footed shot from the left side of the box is saved in the bottom right corner. Corner, Norwich City. Conceded by Sébastien Pocognoli. Own Goal by Sébastien Pocognoli, West Bromwich Albion. Norwich City 3, West Bromwich Albion 0. Attempt missed. Matthew Jarvis (Norwich City) right footed shot from outside the box is close, but misses the top right corner. Goal! Norwich City 2, West Bromwich Albion 0. Kyle Lafferty (Norwich City) left footed shot from the centre of the box to the bottom right corner. Assisted by Gary O'Neil. Attempt saved. Rickie Lambert (West Bromwich Albion) right footed shot from outside the box is saved in the top centre of the goal. Substitution, West Bromwich Albion. Jonathan Leko replaces Stéphane Sessegnon. Substitution, West Bromwich Albion. James McClean replaces Victor Anichebe. Substitution, Norwich City. Kyle Lafferty replaces Dieumerci Mbokani. Attempt missed. Dieumerci Mbokani (Norwich City) right footed shot from the right side of the box is just a bit too high. Elliott Bennett (Norwich City) wins a free kick in the attacking half. Foul by Callum McManaman (West Bromwich Albion). Sébastien Pocognoli (West Bromwich Albion) wins a free kick in the attacking half. Elliott Bennett (Norwich City) wins a free kick in the defensive half. Substitution, West Bromwich Albion. Callum McManaman replaces Serge Gnabry. Sébastien Pocognoli (West Bromwich Albion) is shown the yellow card for a bad foul. Foul by Sébastien Pocognoli (West Bromwich Albion). Attempt missed. Craig Gardner (West Bromwich Albion) right footed shot from outside the box misses to the left. Goal! Norwich City 1, West Bromwich Albion 0. Matthew Jarvis (Norwich City) left footed shot from the centre of the box to the top right corner. Assisted by Dieumerci Mbokani. Substitution, Norwich City. Wes Hoolahan replaces Lewis Grabban. Attempt missed. Elliott Bennett (Norwich City) left footed shot from outside the box is just a bit too high. Corner, West Bromwich Albion. Conceded by Jonny Howson. Attempt missed. Craig Gardner (West Bromwich Albion) left footed shot from outside the box is close, but misses to the left. Substitution, Norwich City. Jonny Howson replaces Graham Dorrans. Second Half begins Norwich City 0, West Bromwich Albion 0.